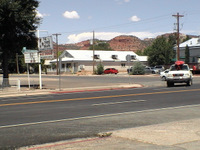 Road trips are full of stops such as Kanab, Utah. It's a town you've probably never heard of, just minutes from the Arizona border. You think you'll just fill your tank for two minutes, grab something from the mini-mart, hit the road, and eventually forget the pit stop altogether. But this was one stop that really made an impression on me. Kanab struck me as a crossroads to adventure - a place where people refuel and recharge on their way to all sorts of thrilling outdoor activities. I took dozens of pictures and even filmed several minutes of video along the main drag. 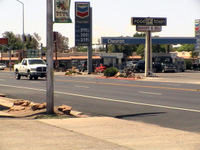 The view from a gas station on a busy street. RVs and trucks drove up and down, sometimes pulling boats and other watercraft. Even in the middle of a desert, people find areas for water recreation. I felt a strong urge to go into every little coffee shop that advertised free wi-fi. I wanted to sit around and listen to people's conversations, and then watch them head off to their next adventure. Make time for this sort of thing on your next road trip. Strike up a conversation or two. Tell people where you're from and where you're going, and invite them to do the same. You'll find that people are eager to swap stories. Most people seemed to be heading south, following Highway 89 towards Fredonia, Arizona. That fork of 89 is a pretty lonely road. It doesn't pass through the Grand Canyon or any cities, but rather, through vast stretches of peaceful scenery. 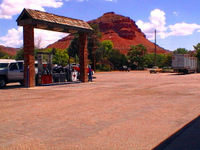 Let's pass a law that requires all gas stations to have such rugged, visually appealing scenery. If you plan your road trip through such a beautiful area, you'll enjoy yourself no matter what happens. It's the darndest thing, but Highway 89 actually splits off at Kanab. You can either take it down into Arizona, or further into Utah. 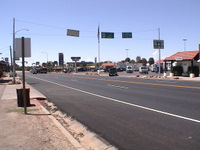 The two 89s run roughly parallel until they meet up again in Page, Arizona. There, they put aside their differences to become Highway 98. 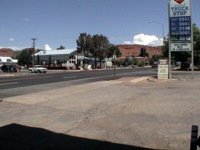 Kanab, Utah is a fun pit stop. If you're driving through the area and don't need gas, find another reason to stop and spend a little time.